To put it simply: music changed my life. It was a saving grace that is still performing miracles on my soul to this very day. As a mom and music nut, I want my daughter exposed to music and the arts as often as possible. Unfortunately, music budgets at public schools are getting slashed as fast as you can say Do Re Mi Fa So La Ti Do. Lucky for us, Ruth Long, the music teacher at Norwood Elementary School, has been providing Julia with top-notch music instruction for four years, as well as other invaluable opportunities throughout our community. It was during one such opportunity that Mrs Long told me about her Adventures in Steel Drums Program idea. She explained that the Jumbi Jams steel drum sets can teach kids about scales, notes, keys, and rhythms in a unique, fun, easy-to-learn environment. They also have the added benefit of being easier to play, especially for young kids who may struggle with their fine motor skills. Want to donate to the Adventures in Steel Drums Program, but can’t make it to the mini session event? Click the button below to contribute $10, $25, $50 or $100 towards the Adventures in Steel Drums Program. I love the drums and I still play my drums often. They’re a great stress relief and brain exercise, and if I had had the Adventures in Steel Drums Program opportunity as a youngster it probably would have changed my life. That’s the kind of teacher Mrs Long is. She changes lives. Of course without funding from a grant or donation, the investment is simply too much for the Norwood music department or PTA budget to handle. Knowing I cannot donate the amount needed to purchase the drums for the school outright, I decided instead to create Portraits for a Purpose, a one day only event to help raise money for Norwood Elementary School’s Adventures in Steel Drums Program. 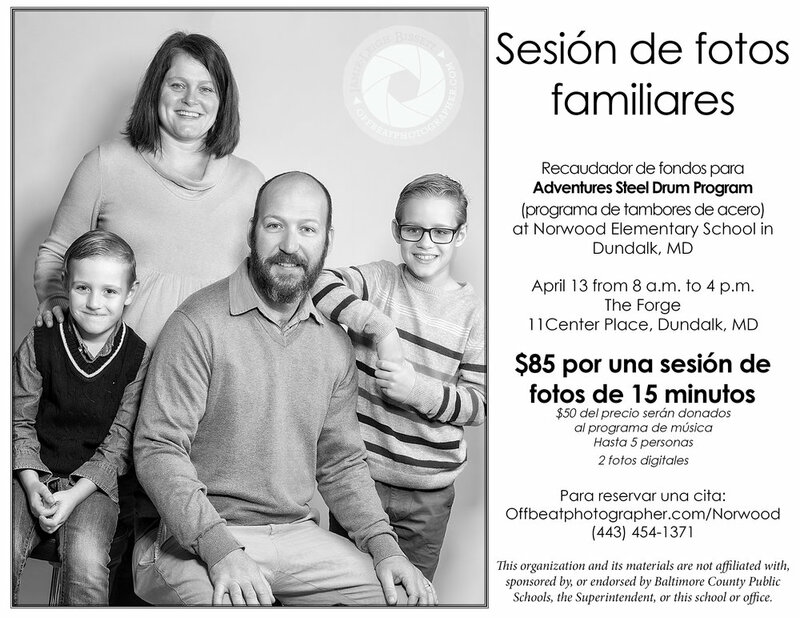 Join me for a series of Mini Portrait Photography sessions on April 13, 2019, from 8 a.m. to 4 p.m. at The Forge in Historic Dundalk, Maryland, located at 11 Center Place. I will offer 15 minute family portrait sessions to 24 families or individuals for $85, $50 of which will be donated to the Adventures in Steel Drums Program at Norwood Elementary School. Each session will last 15 minutes and can include up to five people (no pets). The fee also includes two digital photos of your choice from your session, with an option to purchase additional photos from your gallery. ALL sessions MUST be booked and paid for in advance, and will include an agreement between photographer and client. Please show up no more than 10 minutes prior to your allotted time. For more information, email JLB@offbeatphotographer.com. To schedule your appointment, click here. To see additional photography examples, visit OffbeatPhotographer.com. DUNDALK, MD - Norwood Elementary School students were treated to a performance by Catonsville High School’s Steel Drum Band in March 2019. The Catonsville High School Steel Drum Band, directed by Jim Wharton and Andrew Hamilton, was founded in 1991, and for seven years was the only school steel drum program in the state of Maryland. In addition to giving their own amazing performance, the high school students took it upon themselves to teach the elementary school students and teachers how to play a few notes.